Hi guys, greetings from Romania, in Eastern Europe! I have a 1976 C22 that I bought in the US when I was a grad student, and now I am sailing on the Black Sea. Last year, the boat was dismasted in a freak gale, and in the process I lost the mast step (luckily not the mast itself ). Can any of you kind souls out there send me a clear photo and/or a diagram of the C22 mast step, marked with exact measurements, so I can fabricate it here? 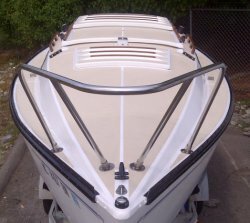 In case there is a confusion, I am talking about the aluminum part in the photo here (this is not from my boat, I snatched it from the Forum, I believe it's from a C26). Thanks a lot and happy sailing! Welcome to the forum sipidel! A C22 sailing the Black Sea! How cool is that?!?!? I do not have the measurements handy but I do have another option for you! I've actually removed that aluminum piece and replaced it with a mast step hinge!! Check out this link here and look through the photos. About 1/3 of the way down you will see two photos, one with the original hook and one with the new hinge plate! That set up worked very well for me! So well, I did two boats that way! @CaptainScott, Thanks for the quick reply. I studied your hinge replacement and it sounds like a good idea indeed. I will look into it. Can you please send me some technical specs? Size of plate, gauge of steel plate and pin, etc? I will need at least approximate values to request a fabrication quote. Last edited by sipidel on Sat May 03, 2014 11:14 pm, edited 1 time in total. @Bubbles, your kind offer is greatly appreciated! Let me inquire about fabricating a stainless hinge, and if i decide I would rather have the hook, I will let you know. Is there any way I can contact you privately, to send you a mailing address, etc.? sipidel wrote: @Bubbles, your kind offer is greatly appreciated! Let me inquire about fabricating a stainless hinge, and if i decide I would rather have the hook, I will let you know.